Tinged with a science fiction-esque name, the Joint Dark Energy Mission (JDEM) will be the first of its kind, solely focused on solving many of the puzzles surrounding the nature of dark energy. Formed in a collaborative effort by NASA and the U.S. Department of Energy (DOE), JDEM will feature a space observatory designed to precisely measure the universe' s expansion rate and growth structure. The data will help physicists understand dark energy; how it works and (most importantly) what it is. JDEM observations will also assist scientists trying to figure how galaxies form and acquire mass. A few things are known about dark energy (although, excuse the pun, we remain mostly in the dark). Dark energy made a de facto appearance in 1998; startling astronomers who were expecting to calculate the rate at which the Universe's expansion is slowing down. Ironically, they discovered that the expansion of the Universe is actually accelerating and that dark energy is at the heart of the cause. 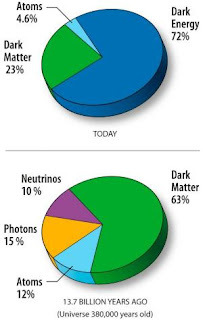 Since then, researchers have gathered that the Universe is made up of about 4% atoms, 22% unknown stuff (similarly termed "dark matter"), and the rest, 74% is expansion-accelerating stuff, what JDEM is interested in. There are a few tricks for detecting the effects of dark energy. Tracking the growth of galaxy clusters by analyzing how gravity distorts light can tell astronomers a thing or two about the stuff's influence, as dark energy maintains a firm grasp on clusters while gravity makes them grow. Another method involves counting clusters at different times in the Universe's past, in order to mold together a sense of how much the Universe has burgeoned. In the coming years, JDEM will make even more precise, space-based measurements that may transform our understanding of dark energy as merely "stuff", to something tangible- or at least definitive.